Move over, Tony Stark — the military could soon have its own “Iron Man” suit, a robotic exoskeleton designed to augment human abilities on the battlefield. A prototype of the Tactical Assault Light Operator Suit, or TALOS, will be available later this month, and a more complete version should be ready between 2016 and 2018, according to Battelle, a science and technology research institute headquartered in Columbus, Ohio. In addition to the TALOS, Battelle is helping develop other innovative technologies such as robotic underwater vehicles, digital “heads-up” displays and a de-icing aircarft coating. The nonprofit research and development organization displayed some of these technologies at a U.S. Special Forces industry conference held May 20-22 in Tampa, Florida. In Greek mythology, “Talos” was a giant man (or maybe bull) made of bronze that guarded the island of Crete by running around it and flinging stones at invaders. 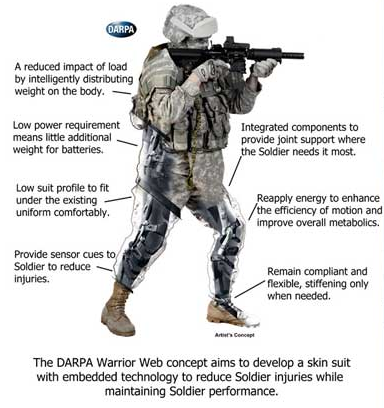 The military’s suit of the same name would protect its wearer from bullets, assist in lifting heavy loads and provide the wearer information about their environment using cameras, sensors and advanced displays. Aside from TALOS, Battelle is developing “heads-up” displays — along the lines of Google Glass — to help military forces synthesize information in their environment. To apply it, the fibers — which are electrically conductive — are sprayed on the plane’s surface. The fibers are then hooked up to a power source that heats them up and prevents ice from forming. Compared to existing alternatives, the carbon nanotube coating is extremely lightweight and consumes very little power, Battelle officials said. Battelle doesn’t only develop technology for the military; the organization furnishes products for civilian uses, too. The nonprofit owns Bluefin Robotics, which developed the Bluefin-21, the robotic submersible that was used to search for the missing Malaysia Airlines airplane in the Indian Ocean. These vehicles are designed to dive to depths of 2.8 miles (4.5 kilometers) beneath the sea surface, withstanding extreme pressure. “If you put a Cadillac SUV on your toenail, it still would not be at that pressure,” said Matt Shaw, general manager of the chemical, biological, radiological, nuclear and explosives defense business unit at Battelle.